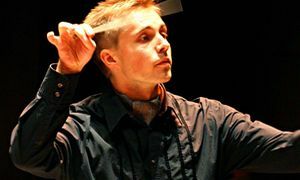 The Royal Liverpool Philharmonic is delighted to announce today that Vasily Petrenko, whose musical leadership has earned him an international reputation, and made him one of the most sought after conductors in the world, is extending his contract as Chief Conductor of the Royal Liverpool Philharmonic Orchestra, which is due to expire in Summer 2015. A new, on-going agreement will see the charismatic Russian maestro stay at the helm of the Royal Liverpool Philharmonic Orchestra, the UK’s oldest professional symphony orchestra for the foreseeable future, with a minimum three-year notice period. This new contract will make Vasily the Orchestra’s longest serving conductor since Sir Charles Groves, who took up the position exactly 50 years and was principal conductor from 1963 – 1977. Vasily took up the baton as Principal Conductor of the Royal Liverpool Philharmonic Orchestra in 2006, and has twice extended his contract. He became Chief Conductor in 2009, in recognition of his commitment to the Orchestra and Liverpool. In one of the most substantial commitments of any Chief Conductor of a UK orchestra, Vasily will continue his current commitment to conduct the Royal Liverpool Philharmonic Orchestra in 25 concerts a year in Liverpool and on national and international touring dates with the Orchestra, as well as recordings and other special concerts and events. Vasily’s dynamic musical partnership with the Royal Liverpool Philharmonic Orchestra has earned a global reputation for excellence. Their concerts, broadcasts and recordings have attracted international critical acclaim, plaudits and awards. Playing for Liverpool on the world stage, Vasily and the Orchestra supported the City of Liverpool’s presence at EXPO 2010 in Shanghai during a tour of China, and have toured together at the invitation of concert halls and music festivals in Spain, Romania, the Czech Republic, Germany, France, Luxembourg and Switzerland. They were the soundtrack to Liverpool’s European Capital of Culture Year in 2008, playing a central role in the delivery and success of many of its festival programmes and events in Liverpool Philharmonic Hall and other city venues. Away from Liverpool, Vasily is Principal Conductor of the National Youth Orchestra of Great Britain and Chief Conductor Designate of the Oslo Symphony taking up the baton in the 2013/14 season and Principal Guest Conductor of the Mikhailovsky Theatre (formerly the Mussorgsky Memorial Theatre) in St. Petersburg, Russia, his native city and where his professional career began in the mid-1990s. Lorraine Rogers, Chairman of the Royal Liverpool Philharmonic said: “Vasily has forged a special bond with our brilliant musicians and staff, our audiences, partners and the City which has produced a golden era for the Royal Liverpool Philharmonic, so this new long-term agreement with him as our Chief Conductor is fantastic news. Liverpool City Council’s cabinet member for culture and tourism, Councillor Wendy Simon, said: “This is fantastic news for the Royal Liverpool Philharmonic and the city. Vasily Petrenko has been awarded the German Echo Klassik Awards 2012 Emerging Artist of the Year; the Classic BRIT Awards Male Artist of the Year in 2012 and 2010, and the Gramophone Awards Young Artist of the Year 2007 for his recordings and musical leadership of the Royal Liverpool Philharmonic Orchestra. Vasily Petrenko and the Royal Liverpool Philharmonic Orchestra are the recipients of the 2011 Gramophone Awards Orchestral Recording of the Year for Symphony No. 10 and the International Classical Music Awards 2010 for Symphony No. 8 in on-going Shostakovich symphony cycle; France’s Diapason d’Or de l’année 2010 for their recording of Rachmaninov’s Piano Concertos Nos. 2 & 3 with Simon Trpčeski; and the 2009 Gramophone Awards Orchestral Recording of the Year for Tchaikovsky’s Manfred Symphony. For his outstanding contribution and impact on Liverpool’s cultural life, Vasily Petrenko has been awarded Honorary Doctorates by the University of Liverpool, Liverpool Hope University and Liverpool John Moores University. He is the Liverpool Post newspaper’s Cultural Leader of the Year 2012, and in 2009, the Lord Mayor of Liverpool, Steve Rotheram, now MP for Liverpool Walton, awarded him the status of ‘Honorary Scouser’. This entry was posted in About Brendan Ball, The Tour Blogs & Brendan's Solo Blogs and tagged "Royal Liverpool Philharmonic Orchestra", 'RLPO', Petrenko, Vasily. Bookmark the permalink. Wow! Absolutely fantastic news. We are so lucky in Liverpool to have such a great team at the ‘Phil. Look forward to MANY years of innovative music making and special experiences with Vasily at the helm. Thank you for your kind comments Ruth. The RLPO is also excited about the news and will be looking forward to years more with Vasily than expected!